Great versatility, visual impact and portability. 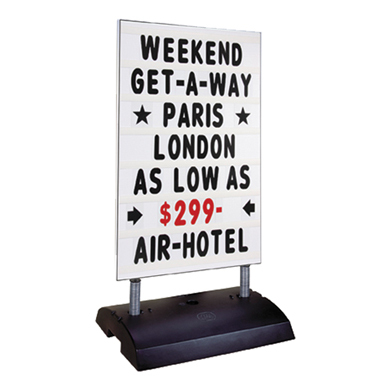 Double-sided Deluxe Springer Sidewalk Sign has a compact base that can be water filled for stability. Built in hand holds make lifting a snap and will fit through any door. Includes over 314 - 4 in. black letters and red numbers and symbols. Each double sided white sign face that can hold up to 7 lines of information. Easy to assemble.